Harman Kardon has revealed the full line up of its new Citation speaker series, at Berlin’s IFA 2018 conference today. Like the Citation 500 smart speaker introduced a couple of weeks ago, the full range has a uniformly sophisticated and sleek design, with the aim of blending seamlessly into any home or decor style. The new speakers are smart too - featuring Google Assistant, meaning that you can ask your Citation speaker questions, set it tasks, and much more. They also come with a high-resolution LCD touchscreen and Chromecast built-in, Google’s dedicated digital media player, which can connect to a number of audio streaming platforms including Spotify and Google Play. 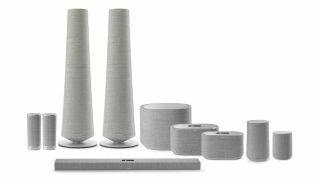 The Citation range includes countertop speakers, a soundbar, a subwoofer, and a pair of tower speakers all available in gray or black wool fabric. The speakers can either be used individually, set up to build a powerful 5:1 sound system, or used around your home, with each speaker capable of playing different tracks in different rooms. All of the speakers in the Citation series will be available to pre-order from the Harman Kardon website from October. Although exact conversions are yet to be confirmed, rough prices are as follows; the Citation One will cost around $230 (£180 / AU$315), the Citation 100 at $360 (£280 / AU$490), the Citation 300 at $450 (£350 / AU$615), the Citation 500 at $750 (£580 / AU$1020) and the Citation Bar at $1030 (£780 / AU$1400). The Citation Sub comes in at approximately $900 (£700 / AU$1250), the Citation Tower at $2700 (£2200 / AU$3700) and the Citation Surround at $520 (£400 / AU$700).